On the one-year anniversary of a bloody confrontation between Red Shirt protesters and Thai government security forces that left scores dead and Bangkok in flames, the opposition Pheu Thai party listed 10 Red Shirt leaders among its candidates for parliament in national elections scheduled for July 3. But the controversy over Red Shirt leaders running for office was overshadowed by the party's choice for its lead candidate: Yingluck Shinawatra, who Pheu Thai hopes will become Thailand's first woman Prime Minister, should the party prevail at the polls. Thailand's first female candidate for Prime Minister drew mixed reactions, however, from Thai women's groups. "There are as many opinions about her candidacy among women's groups as there are women's groups," says Maytinee Bhongsvej of the Association for the Promotion of the Status of Women, a nongovernmental organization. While some are thrilled that a woman will finally have the chance to win the highest elected office in the land, others are disquieted because the 43-year-old businesswoman has no political experience. Her sole qualification for the nation's top job is that she is the youngest sister of Thaksin Shinawatra, the former Prime Minister deposed in a bloodless coup in 2006, and who is Pheu Thai's de facto leader. Thaksin, who lives in Dubai after fleeing a prison term for a corruption conviction, personally chose Yingluck to lead the party, calling his younger sister his "clone." Pheu Thai has already announced its key policy will be to issue an amnesty for anyone charged or convicted for political crimes after the coup. Opponents have labeled this an attempt to whitewash Thaksin, and incumbent Prime Minister Abhisit Vejjajiva has warned that such a move would spark a new round of street protests by those opposed to Thaksin. In 2008, when Thaksin engineered the appointment of his brother-in-law, Somchai Wongsawat, as Prime Minister, anti-Thaksin protesters spilled into the streets. However, despite his ouster and conviction for corruption, Thaksin remains popular with many poor people for his populist policies. He has promised government-issued credit cards for farmers and taxi drivers, free iPads for every student, and debt forgiveness for farmers if Pheu Thai wins and he is allowed to return to Thailand. Yingluck's fortunes are literally tied to her brother's. Her business career consisted exclusively of a series of executive positions in telecommunications and real estate companies owned by Thaksin. With her lack of political experience, Pheu Thai deputy leaders have said they will not allow her to debate Prime Minister Abhisit, who is running for re-election. Maytinee says Yingluck will need to be judged on her own merits as a candidate. "We have to wait and see what kind of decisions she makes and judge her on that. We should respect her for what she does," she says. But some voters and commentators are questioning whether her decisions and actions can reasonably be expected to be her own. In an editorial on Wednesday, the Bangkok Post warned that "more voters will be repelled than attracted if they see her as a 'clone' of fugitive ex-Prime Minister Thaksin. It would be unacceptable if ... she were seen as taking orders or directions from unelected entities, let alone a felon living overseas." By early afternoon on Thursday, Red Shirt protesters were erecting a stage an intersection in Bangkok's business district they occupied for two months in 2010 while demanding Abhisit and his government resign and call new elections. Thousands of Red Shirts were expected to converge on the intersection by late afternoon for a rally and ceremony marking the first anniversary of the crackdown. 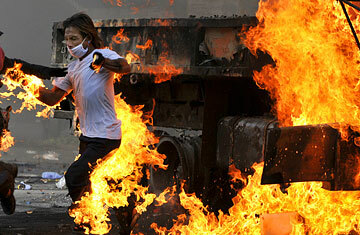 During their two months of protest, 92 people were killed and about 2,000 were injured. A few of the casualties were soldiers, but the overwhelming majority were Red Shirts or bystanders caught in the crossfire. A report by Human Rights Watch blamed the violence on both the security forces for using excessive measures, and the Red Shirts, whose armed paramilitary wing fired scores of rocket-propelled grenades at a variety of targets. Businesses, which suffered heavy losses and damages during last year's protest, voiced exasperation at the return of the Red Shirts, with the Bangkok Post reporting 1,100 cancellations at hotels in the area. The wisdom of the Pheu Thai party, including among its candidates Red Shirt leaders who encouraged their followers to burn down Bangkok last year, was open to debate. While the Red Shirts were able to draw over 100,000 protesters at times, a recent poll by the Asia Foundation showed that only 13% of those surveyed identified themselves as Red Shirt supporters. Various polls gauging the election prospects of the country's political parties have put undecided voters at between 34% and 53%, indicating that the race could be close.